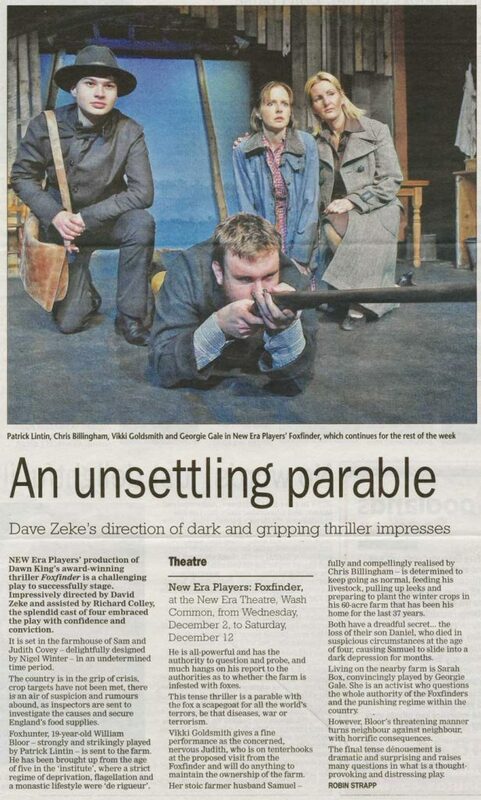 The splendid cast of four embraced the play with confidence and conviction. 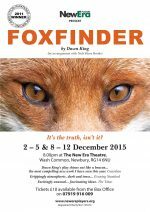 New Era Players’ production of Dawn King’s award-winning thriller Foxfinder is a challenging play to successfully stage. 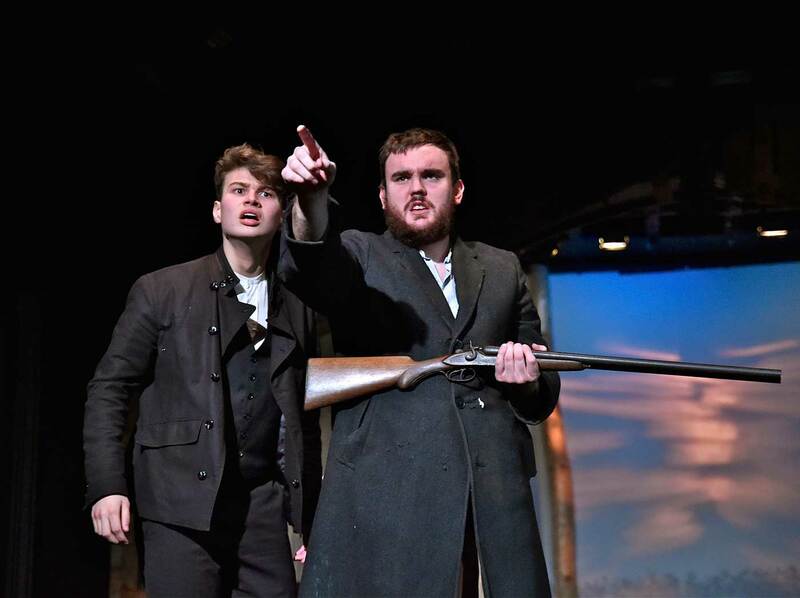 Impressively directed by David Zeke and assisted by Richard Colley, the splendid cast of four embraced the play with confidence and conviction. It is set in the farmhouse of Sam and Judith Covey – delightfully designed by Nigel Winter – in an undetermined time period. The country is in the grip of crisis, crop targets have not been met, there is an air of suspicion and rumours abound, as inspectors are sent to investigate the causes and secure England’s food supplies. 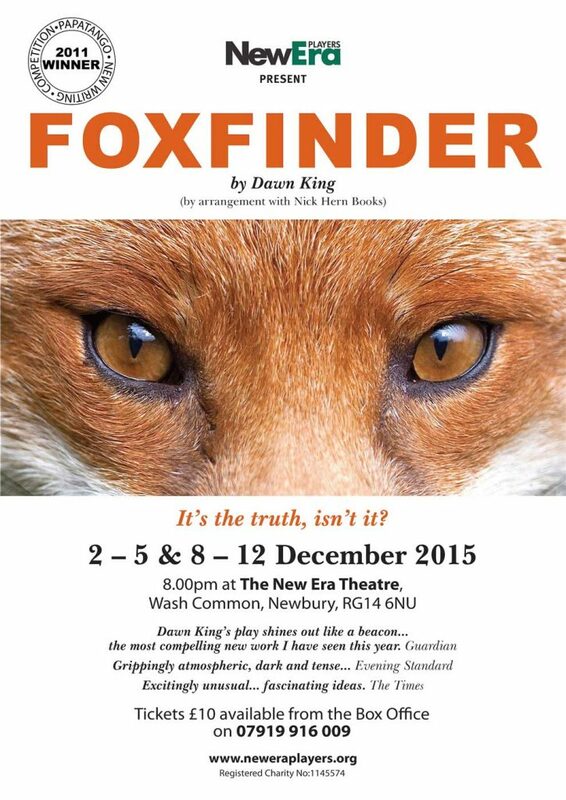 Foxhunter, 19-year-old William Bloor – strongly and strikingly played by Patrick Lintin – is sent to the farm. He has been brought up from the age of five in the ‘institute’, where a strict regime of deprivation, flagellation and a monastic lifestyle were ‘de rigueur’. He is all-powerful and has the authority to question and probe, and much hangs on his report to the authorities as to whether the farm is infested with foxes. This tense thriller is a parable with the fox a scapegoat for all the world’s terrors, be that diseases, war or terrorism. 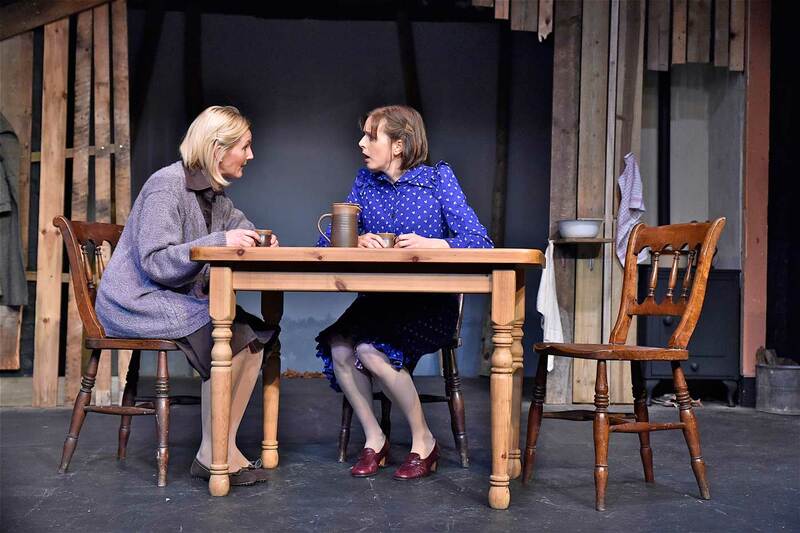 Vikki Goldsmith gives a fine performance as the concerned, nervous Judith, who is on tenterhooks at the proposed visit from the Foxfinder and will do anything to maintain the ownership of the farm. Her stoic farmer husband Samuel – fully and compellingly realised by Chris Billingham – is determined to keep going as normal, feeding his livestock, pulling up leeks and preparing to plant the winter crops in his 60-acre farm that has been his home for the last 37 years. Both have a dreadful secret… the loss of their son Daniel, who died in suspicious circumstances at the age of four, causing Samuel to slide into a dark depression for months. 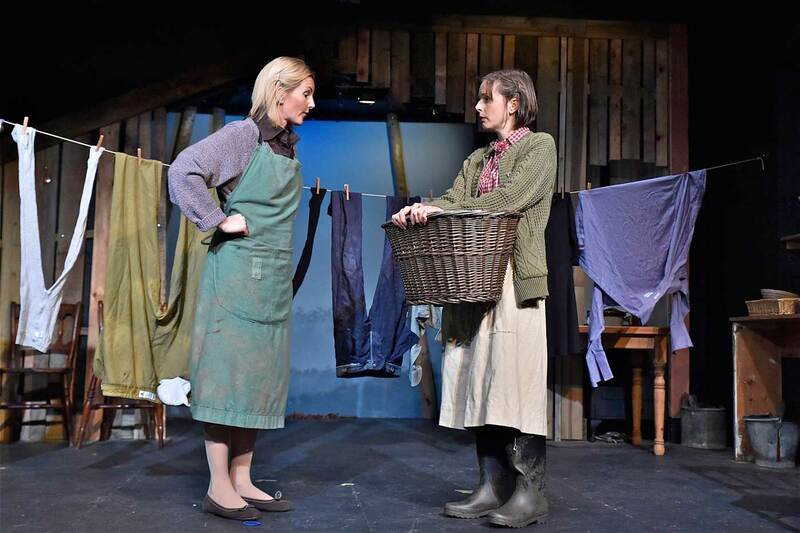 Living on the nearby farm is Sarah Box, convincingly played by Georgie Gale. She is an activist who questions the whole authority of the Foxfinders and the punishing regime within the country. However, Bloor’s threatening manner turns neighbour against neighbour, with horrific consequences. 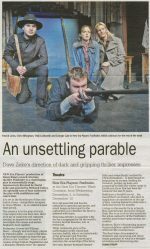 The final tense denouement is dramatic and surprising and raises many questions in what is a thought-provoking and distressing play. 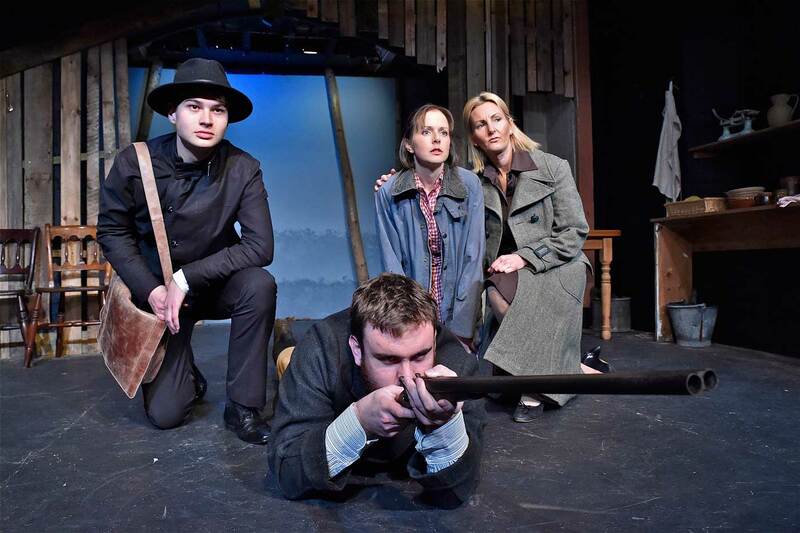 William Bloor, a ‘foxfinder’, arrives at Sam and Judith Covey’s farm to investigate a suspected contamination. 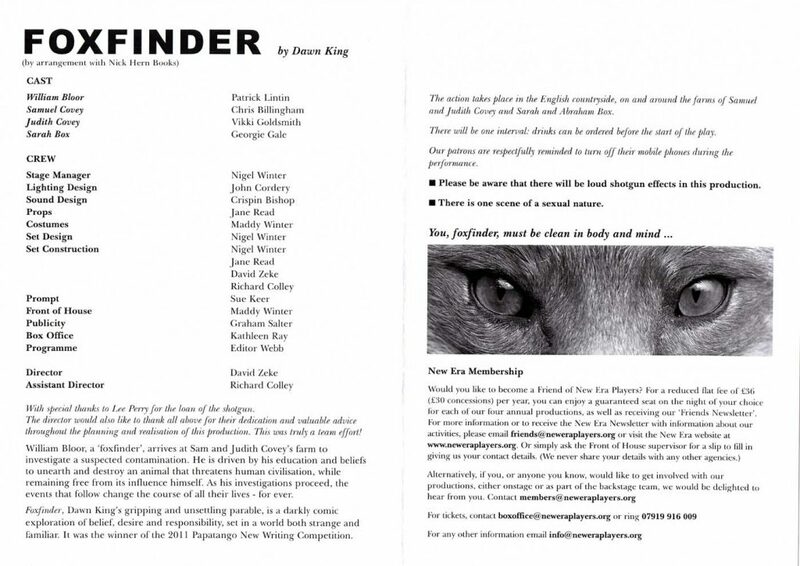 He is driven by his education and beliefs to unearth and destroy an animal that threatens man’s civilisation, and to remain free from its influence himself. As his investigations proceed, the events that follow change the course of all their lives – for ever.